"It's hard to avoid thinking as though this deck is an oracle in itself, combining the positions as though they tell stories without oracle cards. 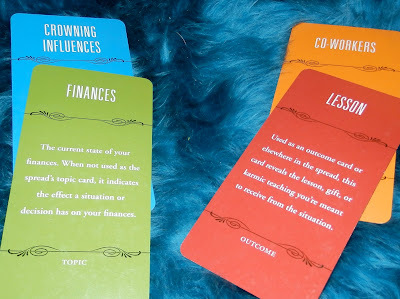 So 'The crowning influence is your finances, but your co-workers can teach you a lesson here....'"
So I tried it tonight myself to see what I got. I asked what I should be focusing on at this point in my life and I got "What to Know" "Body" "Cons". That's actually a very relevant answer as health is definitely on my mind. It actually brings up a couple of relevant issues regarding that for me. Very interesting and fun to try!